The Candlelight Processional is a longstanding Disney tradition and can date back to carolers at Disneyland in 1955. A second version of the show would venture east with the establishment of Walt Disney World, and resided in the Magic Kingdom for more than two decades. In fact, the Candlelight Processional as we know it now wouldn’t come to Epcot until 1994. Does that mean that Epcot didn’t have a holiday showcase during its first decade? Of course not! Between 1983 and 1994 EPCOT Center was home to Holiday Splendor, a stage show that took place at the American Gardens Theater. Following the well-established holiday show format, the show featured guest narrators and singers that could be changed out regularly. While Christmas was the focal point, the show recognized the park it took place in and emphasized how the holidays were celebrated in countries around the globe. Think of it like Holidays Around the World condensed into a single stage production. Holiday Splendor ran for approximately half an hour with a live orchestra and a host of dancers and performers accompanying the guest narrators. Children would come out and be introduced as guest performers and then take a seat on stage as if hearing the stories as part of the audience. The pair of children would occasionally stand up and add to the number being performed by the headlining narrator. The opening number was framed around traditions and expressed the story and traditions of Chanukah. Holiday Splendor then moves quickly between customs and rituals common today but that come from Mesopotamia (Zagmuk), pagan druids (mistletoe), and even Chinese New Year before moving into an entirely 1980s EPCOT Center song about the story of Christmas. A whirlwind of songs more commonly associated with Christmas from around the world follows, with the show concluding with dancers and singers representing all nations coming together on the stage in the finale of Let There Be Peace on Earth. The show was a massive undertaking, but Holiday Splendor was not presented every night between Thanksgiving and New Year’s Eve. In fact, in 1989, when the above photo was utilized to promote the production, it would only run December 16-17 and 20-23 with two performances per night, and with three performances a night for December 25-30. A grand total of 30 performances for the season, which would be considered a drop in the bucket these days, but it put a definite emphasis on the times when they knew guests would be present. 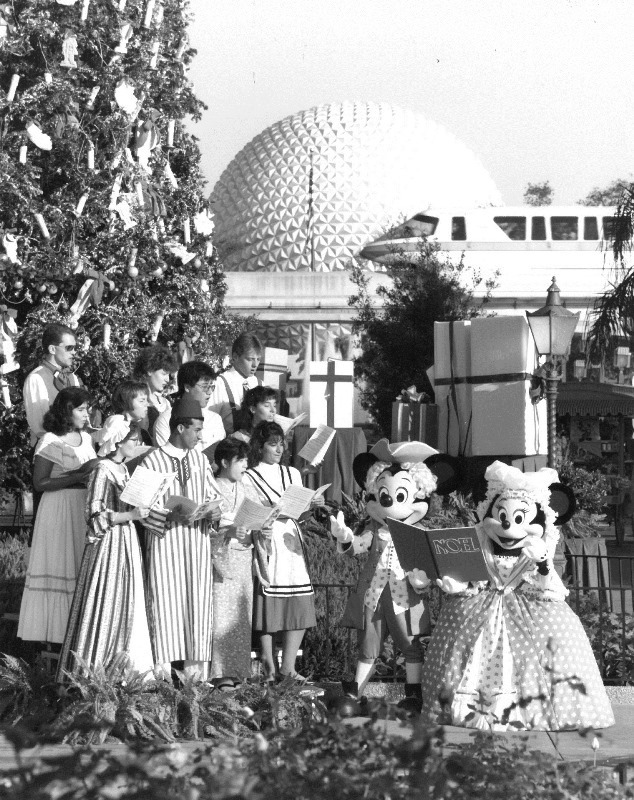 There have been many holiday performances in the parks over the years, and each has its own tale to tell. The Candlelight Processional is certainly the most storied, but every show has its supporters and those who love it best of all. Yet, I’m certain that Holiday Splendor holds a special place in many hearts out there.